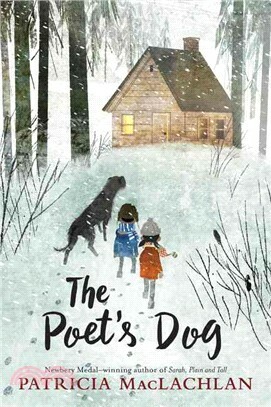 From Newbery Medal winner Patricia MacLachlan comes a poignant story about two children, a poet, and a dog and how they help each other survive loss and recapture love. Teddy is a gifted dog. Raised in a cabin by a poet named Sylvan, he grew up listening to sonnets read aloud and the clicking of a keyboard. Teddy understands words, but Sylvan always told him there’s only two kinds of people in the world who can hear him: poets and children. Then one day Teddy learns that Sylvan was right. When Teddy finds Nickel and Flora trapped in a snowstorm, he tells them that he will bring them home—and they understand him. The children are afraid of the howling wind but are not frightened by Teddy’s words. They follow him to a cabin in the woods, where the dog used to live with Sylvan. Once they have shelter, the three of them build a fire and wait for the sky to clear. Over the course of the storm, they will discover what Sylvan has left behind—cans of food, photographs, and an old weather box—but in a home filled with memories, can they also help each other find what they have lost? Patricia MacLachlan is the celebrated author of many timeless books for young readers, including Sarah, Plain and Tall, winner of the Newbery Medal. Her novels for young readers include Arthur, For the Very First Time; The Facts and Fictions of Minna Pratt; Skylark; Caleb's Story; More Perfect than the Moon; Grandfather's Dance; Word After Word After Word; Kindred Souls; and The Truth of Me; she is also the author of countless beloved picture books, a number of which she cowrote with her daughter, Emily. She lives in Williamsburg, Massachusetts..